French Bulldogs are a popular breed—and why would they not be! After all, these playful and affectionate dogs have stolen our hearts! Did you know that French Bulldogs are the fourth most popular breed in the United Kingdom and the sixth most popular breed in the United States? Like all dogs, Frenchies love to go out on long walks and play in puppy parks. French Bulldogs are known to suffer from a condition called ‘brachycephalic syndrome’ which is caused by the anatomical structure of the dog – namely the narrow nostrils. The main problem this disorder results in is difficulty in breathing. If you notice excessive panting from intense exercise, calm your dog down until they catch their breath. French Bulldogs don’t do well with the classic collar and leash. They need special harnesses that don’t restrict their breathing and constrain their necks. In this blog post, I would like to share my top 5 picks for the best harness for French Bulldogs. So, let’s just jump right in! Making sure that your Frenchie is super comfortable while on a walk is something that we all want, right? In this section, I would like to share a few things that you should consider before investing in a harness. So, let’s take a look, shall we? The Right Size: In order to be considered the best harness for French Bulldogs, it should fit your doggy friend just right—after all, with a small and round body, the right size might be hard to find. If the harness is too large, your doggy friend will end up slipping out of it time and again and you’ll have to keep putting the harness back on him again and again during a walk. If a harness is too small for your furry buddy, it’ll be extremely uncomfortable and would also cause breathing troubles—which is something that we need to avoid! The Right Material: If the harness you’re looking to buy for your bulldog is not constructed with high quality material, you might very well be shopping for another harness real soon. Invest in strong and durable materials, and a good harness can last years. So, I would recommend you to invest in a good leather harness—a material that’s comfortable for Frenchies to wear for long periods of time, and can last for many years to come. 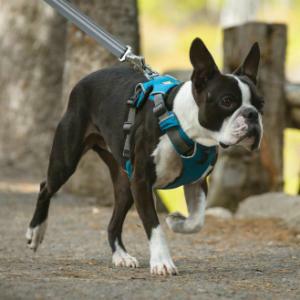 Harnesses made from low-quality materials—such as Nylon are cheaper in price but they aren’t very long-lasting and may even cause skin irritation and other related problems. A good quality harness always has sufficient padding on it to create a ‘cushion’ of sorts that basically creates a layer of protection between the harness and your doggy friend’s skin. Discouraging Pulling: We all know that Frenchies like to pull. And, accompanied with the right training, we also need to make sure that the leash we invest in is designed to discourage pullers. So, you won’t necessarily have to deal with your Frenchie pulling the leash when you’re out for a walk and dragging you in the wrong direction. Easy To Put On: This is something that is breed-specific. While most breeds are patient, Frenchies are known to be really fussy—especially when you’re putting stuff on their body! So, you need to find a harness that’s really easy to put on your doggy friend and isn’t a task on its own! I really like the kind that can be snapped into place as your doggy walks into them—it saves time and energy. Compact: If you get a good-quality and compact that can be carried anywhere—like on beach trips, and trekking—you get the idea, right? This way you and your Frenchie can both enjoy a trip without you worrying a lot about your dog wandering off or slipping out of the harness. Like I mentioned before, finding a harness that’s the right size for your furry friend is extremely important. A harness of the wrong size can cause a lot of problems such as rubbing against the skin, causing uncomfortable skin irritation, resulting in pain, and even shortness of breath. In this section, I’ll help you figure out how to get the right size harness for your dog. If you haven’t already, invest in a measuring tape and measure your furry friend—estimates aren’t really reliable. Knowing the exact measurements of your dog will help save you money and refund troubles. Harnesses are usually sold by the dog’s weight. However, if you combine the weight with the measurements, you get the ideal size for your pooch. If you’ve got your hands full with your active puppy, I’d advise you to get someone to lend you a hand and help you out with the measurements. In order to get the measurements right, you should measure your pooch from the broadest part of his chest—the area right behind his armpits. All you need to do is to wrap the tape around your doggy friend’s body–but not too tight or loose! All you need to do is to combine this measurement with the weight and you’ll get the sizing just right. When looking for the right harness, make sure you get one that’s not more than 2 inches of your dog’s actual measurement. Add in the weight factor and that’s it. When you can’t find your dog’s exact size but do find ones that are a bit smaller or larger then, I’d advise you to invest in the larger one as you won’t be able to adjust or tweak the smaller one. A quick tip for larger harnesses is to loop a knot and that should take down an inch or so. The Best Harnesses for French Bulldogs Available to Buy Right Now! Looking for good and reliable brands? I’ve shortlisted a few select ones from experience and reviews. I totally understand that you want to invest in the right harness for your Frenchie—after all, you only want the best for him! But, in this age’s hectic lifestyle it’s really hard to take the time out to sit down and spend a few hours researching stuff—there are so many considerations! So, I decided to make things a bit easy for you and help you make the decision. Don’t worry, I’ll go over each and every one of these in detail and help you determine the best one! Let’s check these harnesses out! I feel that the Ruffwear All-day Adventure Harness provides a perfect solution as it is durable, strong, and perfect for dogs that tend to pull. 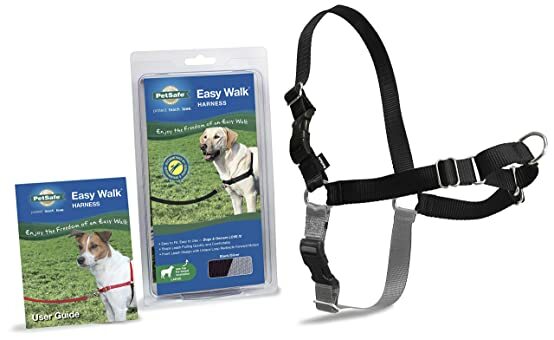 This is the perfect solution for pullers and comes with two attachments—one on the front for when you’re training your dog, and one on the back for a nice and relaxed stroll. You know that this harness isn’t going to break off as the reinforcement of the aluminium attachment points is strong. All you need to do is to slip this harness onto your dog’s head and secure it into place and you’re done! Let’s look at the pros and cons, shall we? 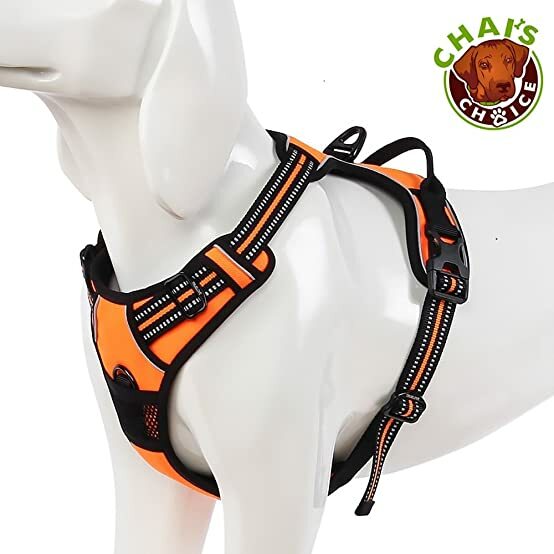 Chai Choice Front Range Dog Harness is also a good harness as it is light in weight, resistant to scratches, and is adjustable. The harness has good visibility during the nighttime and as it has 3M reflective material. Let’s weigh the pros against the cons, shall we? 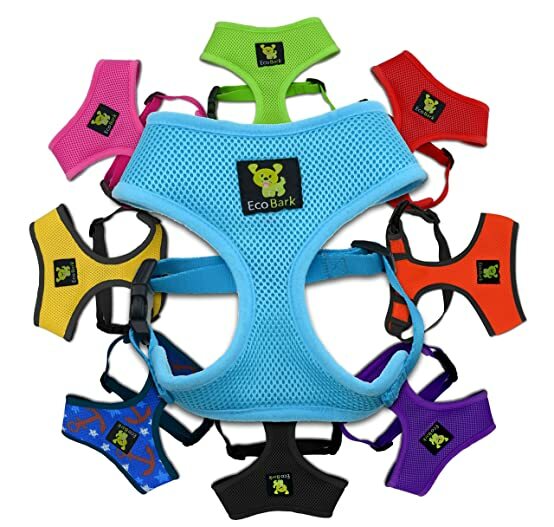 The EcoBark No-Pull Harness is also another good alternative as it is made of soft and durable eco-friendly material which is actually sourced from recycled water bottles! So, you’ll be doing something good for the environment by purchasing this harness! Designed to protect the dog’s trachea—which is good for breathing problems! Good for outdoor activities such as, hikes, long walks, runs, etc. It’s pros and cons time! I feel that the Kurgo Tru-Fit Dog Harness is also a good choice for your Frenchies because it has a lifetime warranty and is tested to be completely safe to use. Let’s take a look at the features, shall we? 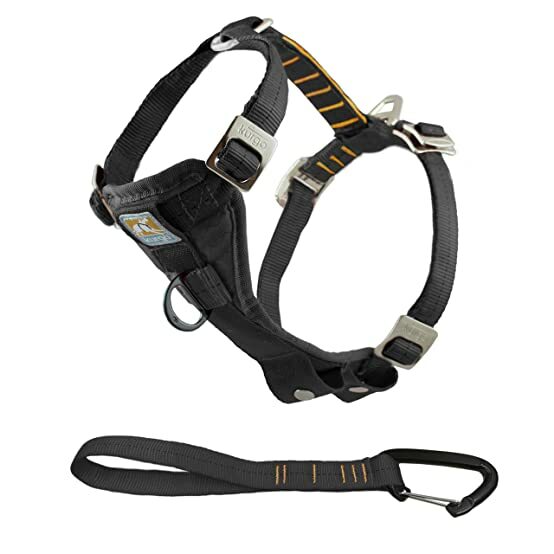 This harness features 5 adjustment points. 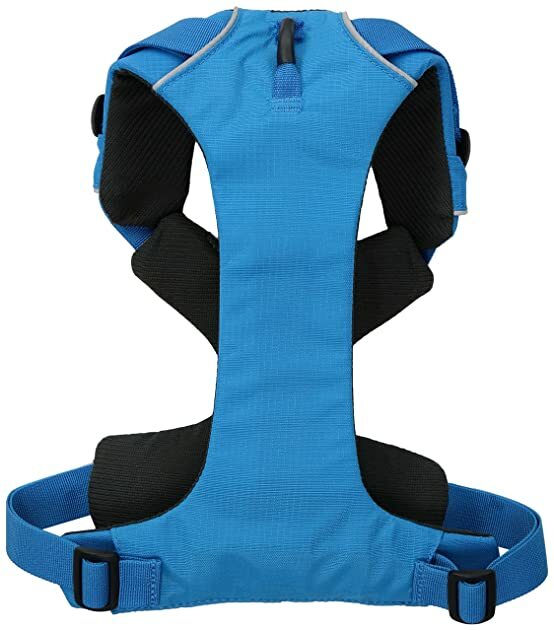 This means that this harness can be customised according to the needs of just about any doggy! This is the final one! I really like the Petsafe EasyWalk harness for Fresh Bulldogs because not only does it stop your dog from pulling and tugging, it is also a safe and padded choice for you doggy! It fits your furry friend just right as it features four points of adjustment and all you have to do is to strap your pooch in! All in all, this is one of the best brush for Husky available in the market! Worth the money you pay. I really feel that the right harness can make things easier for you and your French Bulldog. Let me know in the comments section if I helped you find the best harness for French Bulldog! French Bulldogs are built in a way that makes them prone to breathing difficulties and a traditional leash can really make things worse for your furry friend. Good quality materials also go a long way! In this blog post, I’ve gone over a few options that you can consider to buy for your cute little Frenchie.